Wormman.com is offering the worm food we use in One Pound (1 lb.) bags. Purina Worm Chow is perfect for Redworms and Euroworms and does not contain food items that will sour your bedding. Just sprinkle a pinch in a bin or bed, and let your worms eat. Directions: Feed worms daily or adjust feeding schedule to management program. When surface feeding, sprinkle the bed lightly with water and scatter the feed lightly over the bed surface. Adjust the amount of feed to what the worms will consume daily. When redworms are raised in bedding which contains composted organics (food items, manure, etc.) decrease the feeding rate. Be sure the feed is consumed before feeding again. The amount of feed depends upon the number of worms in the bed. Overfeeding may lead to a sour, moldy bedding which is undesirable. For best results, stir or turn the bedding at least twice a week. Keep the bedding loose and well aerated. Either mix approximately 5% agricultural limestone in with the feed or sprinkle the bedding lightly with agricultrual limestone (use calcium carbonate; do not use prepared or dehydrated lime or calcium oxide) each time the bedding is turned. Do not sprinkle feed or limestone directly upon worms. One Pound is just $16.55 shipped Free. 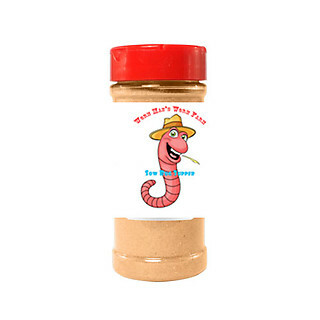 Get your worm food today! Please note that the worm food is shipped separately from the live worms.